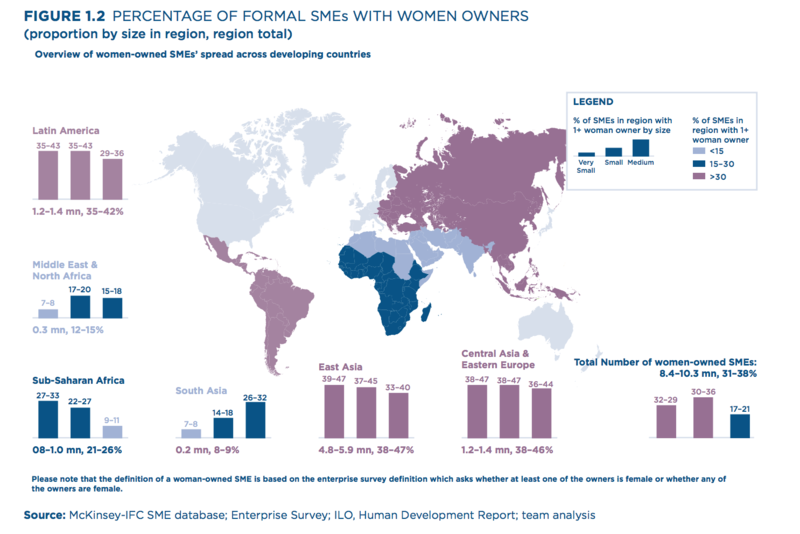 The majority of women entrepreneurs run micro, small and medium-sized enterprises. For the last 30 years, trade has been one of the stabilising pillars of the global community – creating jobs, supporting the development and spreading of technology and ideas, boosting productivity, expanding consumer choice and enabling cross-border communications channels and supply chains. In material terms, our global economy has never been more prosperous. Yet open trade faces the serious risk of derailment due to ongoing protectionist rhetoric and geopolitical tensions. That is on top of the threats that climate change and natural disasters pose to international supply chains. The political risks to globalisation are, in great measure, the result of economic exclusion. In many advanced economies, large sections of society have felt excluded from the gains of recent decades. Years of sluggish, unequally shared growth following the crisis have brought these concerns to the fore. Still, there is good news for spurring growth and equity in the form of the billion or so women poised to engage in economic activity. Empowering women to participate equally in the global economy could add $28 trillion in GDP growth by 2025. Their participation in the economy would stimulate wider benefits. Studies of economies as varied as Bangladesh, Brazil, Canada, Ethiopia, and the United Kingdom, suggest that women generally devote more of the household budget to education, health, and nutrition than men. Societies with greater gender equality not only offer better socioeconomic opportunities for women, but also tend to grow faster and more equitably. There are gains in poverty reduction, environmental sustainability, consumer choice, innovation and decision-making on a wider set of issues. For instance, the World Bank found that in Latin America and the Caribbean, women have played a critical role in the decline of poverty, with female labour market income contributing to a 30% reduction in extreme poverty over a 10-year period. The majority of women entrepreneurs run micro, small and medium-sized enterprises (MSMEs) – more than 30% of MSMEs are owned by women. Yet only one in five exporters is a women-owned business. Lowering the barriers faced by women entrepreneurs at home and internationally, and helping more businesswomen to connect to international value chains, would bolster growth and inclusion. It would create more – and better-paying – jobs for women, not least since women-owned firms hire more women, especially at senior levels. That is why taking gender into account matters when developing and implementing trade policy. Placing women at the heart of global policymaking will go a long way towards realising the United Nations 2030 Agenda goal of achieving gender equality and empowering all women and girls. Economic development and gender equality go hand-in-hand. So why haven’t we invested more in supporting and developing these aspects of the global economy? One of the key challenges, as highlighted in the recently launched World Trade Organisation Buenos Aires Declaration on Trade and Women’s Economic Empowerment is that steps to empower women economically is happening slowly – and not systematically. In the area of global trade, we have made some small progress in helping women enter global markets, either directly or as part of global supply chains. Women are not less capable at exporting; instead, they often lack access to information, finance and technology – and may need additional encouragement to overcome some of the initial barriers. The problem is not that the exporter is female, but that the system is not attuned to ensuring women have the same access to these opportunities as men. But once women start exporting, the impact is clear. Through the SheTrades initiative, International Trade Centre works with a range of partners across the world – including UPS – to connect women entrepreneurs to markets. Last year, less than 5% of total official development assistance was devoted to women’s economic empowerment – and investments into women-owned enterprises, or initiatives targeted at women and trade, remain largely unassessed. Monica Musonda, a Zambian entrepreneur manufacturing locally sourced nutritional foods, is selling into the growing health food sector. Monica's vision is to change the eating habits of African youth by offering them affordable and nutritious food options made from local products. The success she has achieved with Java Foods demonstrates the benefits to women entrepreneurs – and the communities they serve – when development aid is coupled with private investment. Monica employs 20 workers to process Zambian cereals. With the right technical advice and targeted investment, she improves Java Foods’ productivity and the quality of the nutrition products for both local consumers and those in southern and eastern Africa. This is just one example of what millions of women around the world are doing. If we want to see the global economy prosper, we must enact the domestic policy and structural reforms that will empower women and MSMEs. Flexing what has been an underutilised muscle will enable us to realise new and measurable gains – including a credible response to the concerns around growing wealth inequality.